£180 Full waged / £150 Part waged / £120 Unwaged. There is a small and strictly limited number of low-cost bursary places available for those who cannot afford the retreat fee. Please contact the Centre office if you wish to apply. Buddhism points out that all life involves some suffering – but shows us how to face up to that fact in a way that leads to a true fulfilment, even joy. Join us to explore how, in a simple programme of meditation, study/discussion groups and devotional practice, with plenty of free time to do nothing, go for walks in the beautiful natural surroundings, or hang out together. The Buddha reminded us that suffering is woven through life, and showed that our suffering arises because we expect permanence where there is only change and a true substance to things where there is really nothing you can finally grasp hold of. But he also taught that facing up to these superficially gloomy facts is actually our way to a far more expansive, happier world view, and far greater contentment. If we look our suffering in the face, we can free ourselves from it by understanding the attachments that cause it. When we really contemplate impermanence, we can see that it is change that makes life beautiful and progress possible. 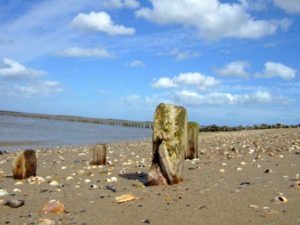 When we look deeply into insubstantiality, we realise that it is the open dimension of life and the connectedness of all things that underpins true happiness. As the Diamond Sutra says, this fleeting world is ‘a star at dawn, a bubble in a stream/ a flash of lightning in a summer cloud’; it is a dream we must wake up from, and that awakening comes when we have the courage to open these three doors on the true nature of existence. 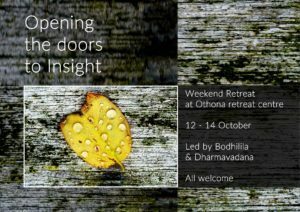 Our venue is for the retreat is Othona, a comfortable but simple, ecologically sensitive retreat centre about two hours drive from WLBC – a beautiful, peaceful setting on the Essex coast just a few metres from the beach, amid by salt marshes, woods and wildflower meadows. The weekend is a chance to come back to ourselves and reconnect with what’s most important in our life; a chance also to connect with others, finding mutual support and friendship as we live together in harmonious community. In conditions like these, even just a few days can have a strong and surprisingly lasting effect.